86 • RV PRO • November 2018 rv-pro.com A F T E R M A R K E T end-user would be, why it made sense to sell to them (through distributors and dealers), and what the applications are. Hamanishi says it's a big obligation for the sales and marketing teams to leverage that information and to look at market positioning. The greatest challenge, though, was taking the technically complex ideas of power con- version and presenting it in a way where con- sumers understand their needs. 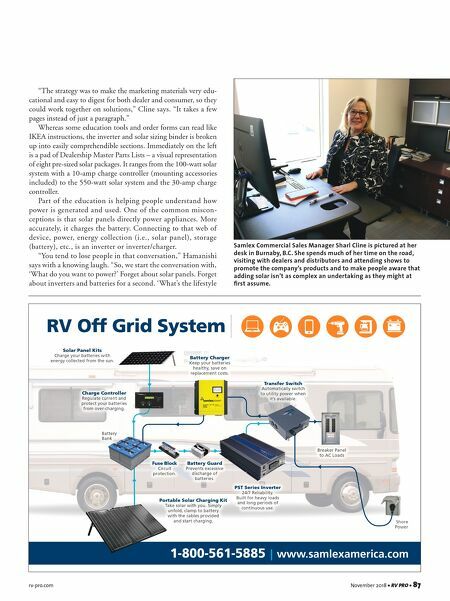 "The RV marketing strategy had to be consumer-friendly – not installer/engi- neer-friendly," says Sharl Cline, Samlex director of sales and marketing. The solution to the puzzle, the Samlex team learned, became an educational binder. Book of Knowledge To make Samlex's products – and the technologies behind them – more approachable for dealers, the company developed its Samlex Dealer Success Program, which includes an inverter and solar sizing binder. 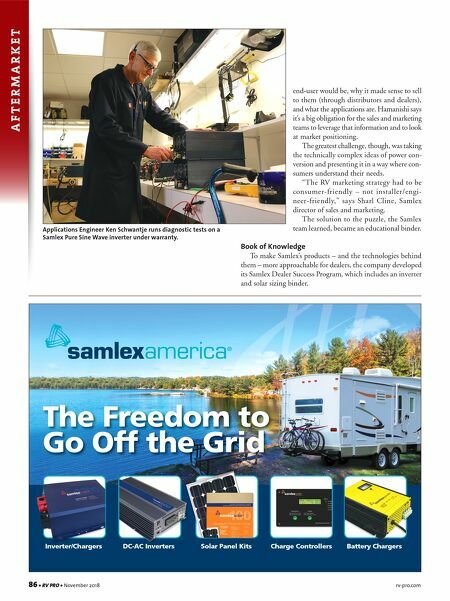 The Freedom to Go Off the Grid Solar Panel Kits Battery Chargers Inverter/Chargers DC-AC Inverters Charge Controllers Applications Engineer Ken Schwantje runs diagnostic tests on a Samlex Pure Sine Wave inverter under warranty.